You’ll Want To Include A Little Of This In Your Home Decor! The so called “rules” of decorating say that every room should have a touch of black. Okay, but did you know that there’s another element that I think is important to include? It’s another one of those things that you may not give much thought to, but can make all the difference in the warmth and welcoming appeal of a room. That element, my friend, is wood tones. I quite literally stumbled upon this realization by accident. 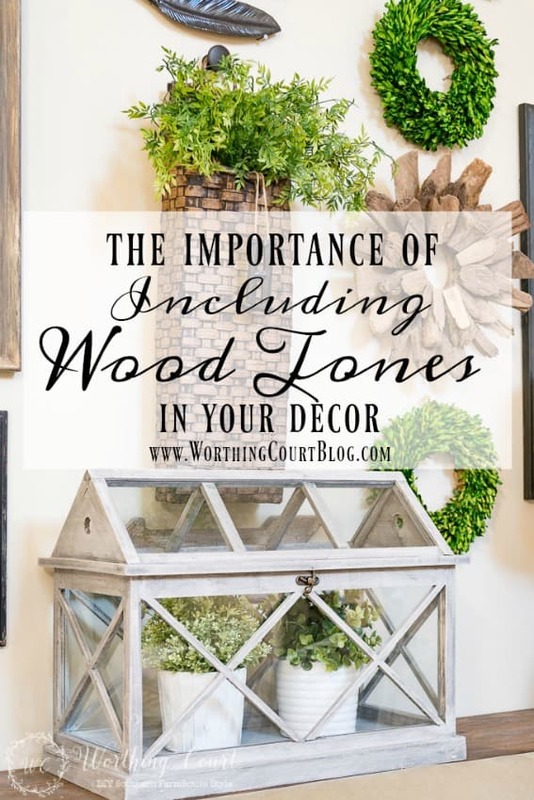 As I’ve been working through the process of making over every single room in my house, I’ve come to believe that every room needs to have at least a little bit of something wood toned in it. There are lots and lots of ways to add those tones to your rooms! Let me show you a few. Yes, my breakfast area already had wood floors, diy wood shelves and a wood sideboard – I guess those are to be expected. But something magical seemed to happen when I added the curtains that also have a bit of brown mixed in with the mostly gray medallion print. I know you all love it too because I get lots and lots of questions about those draperies! I purchased them at Target, but sadly, they no longer carry them. 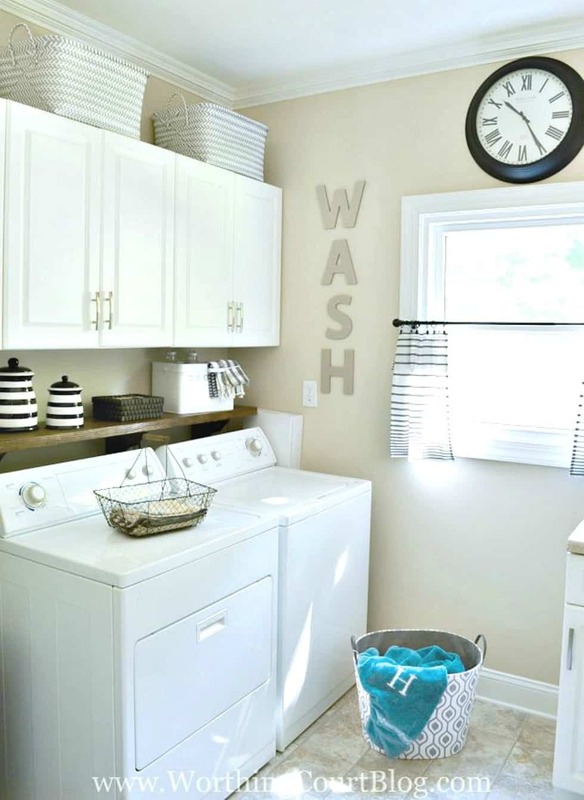 You might not think about your laundry room, but hey – you have to spend time doing laundry – right??? May as well make it as pretty as you can. The addition of a chunky wood shelf above the washer/dryer warmed up what would otherwise have been a cold and sterile looking space. 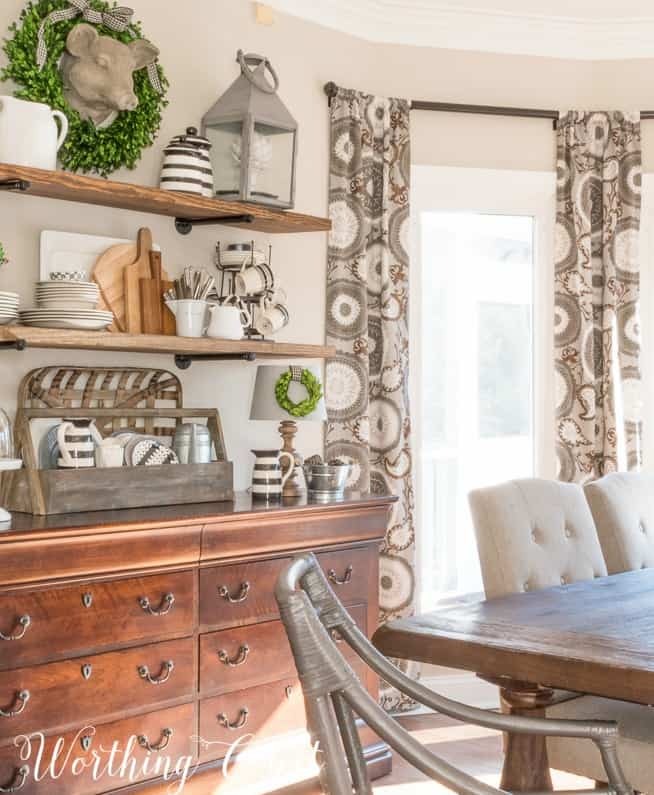 I had TOO much wood in my dining room – that is until I gave it a makeover! 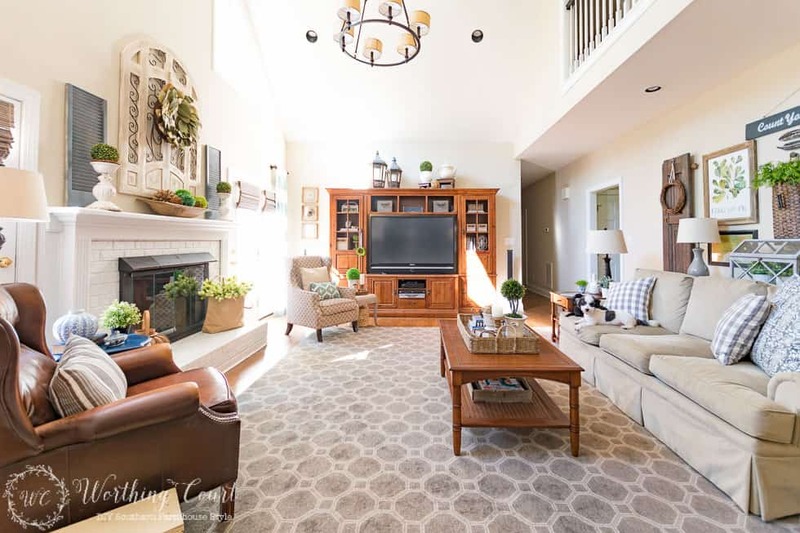 Paint and an area rug took care of the sea of brown, but what I think really makes this room sing is the addition of diy FIxer Upper style hanging lanterns. My home office is another space where I broke up the sea of brown by giving my shelves a huge makeover and painting the desk legs gray. Since there are so many beige and gray elements in this room, I made sure to add several wood toned accessories to warm it up. And one last example…our family room. When decorating this room, I very seriously considered painting our entertainment center. It’s huge and it’s brown! I’m so glad that I didn’t take that step. Yes, I think it would have looked fine if it were painted, but this is a large room and I think that removing this one large wood toned element would have taken away from the warmth of the room. I did manage to give it a bit of a farmhouse makeover without using any paint though. 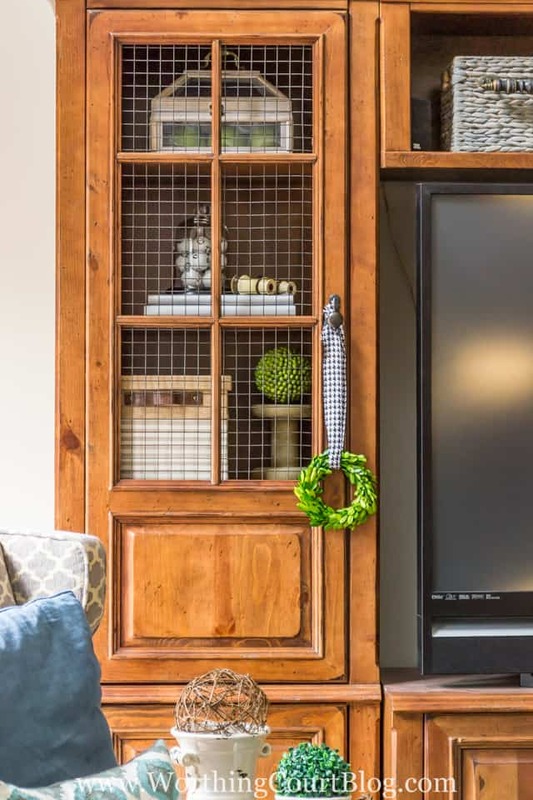 The entertainment center isn’t the only wood toned element in the room. There’s also my diy blanket ladder, diy sofa table and many of the elements that are a part of the gallery wall. I would never have believed that I’d be recommending that you add a little brown to your rooms, but it will make all the difference in the world! What do you think – are you a fan or not so much? YOU MIGHT ALSO LIKE THESE DECORATING TIPS! Love the brown touches … thanks for pointing that element out. Love the touch of wood. I totally agree! Wood elements do seem to warm a room. Love the pictures of your house. I’m in the process of redecorating a few rooms in my home and you give me inspiration each day I open up your email. I sincerely look forward to them and I thank you for taking the time. Also, I call my youngest Pookie. Love that you call your husband the same. Have a lovely day! Thanks for sharing another great tip! Spot on, as usual! Yes, I agree. It does add warmth. 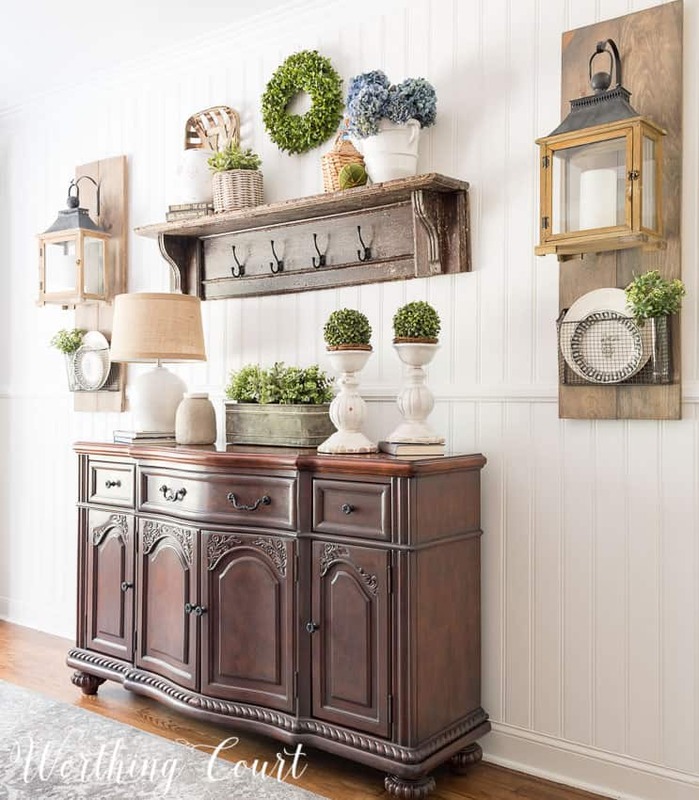 Love the way you hung those lanterns with the added baskets! The whole items together work so well!! Great look! Your house is lovely. All your tips are helpful and you provide great inspiration to try something new. Thanks for sharing and enjoy your day. Wood tone elements look good in your home. My husband agrees also because he loves wood. I have to give and take on those elements in my home. Love wood touches! My rooms are wood, blacks, whites and tan. I feel I can add most any colors to them to accent the seasons. You are a true inspiration to us all! Thanks for sharing! 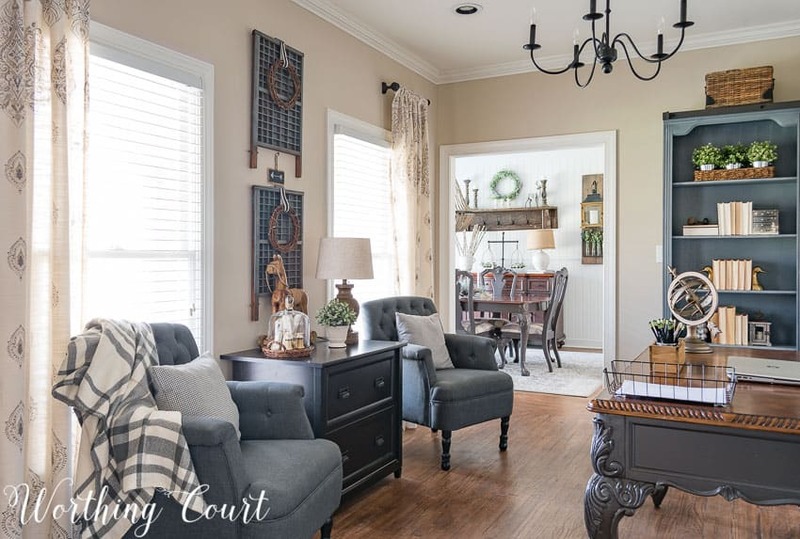 I’m a big proponent of a “little black dress” in every room, and I totally agree with your idea that wood tone will add warmth and break up spaces that are just a little too monotone. Your beautiful home is the perfect example! I totally agree with how important wood tones are in your home. I love the natural wood look and I do think it adds a sense of warmth. I would like to change my oak cabinets to white, but that would be a huge task and I’m afraid it would only lead to more changes!! I do love your kitchen and dining room!! I do love some wood tones sprinkled throughout. I have so much brown in my decor that I’m chalk painting some of it white. I just love the grey paint you’ve used on your desk legs and in other locations. Would you share the source and name of that color? I agree that the wood tones do add warmth. The lighter tones make it bright and airy. Beautifully put together. Thanks for sharing. It’s always a blessing to see pics of your home! I see something new every time! I absolutely love warm tones and textures. Wood would be top of that category. Until recently I would have never considered painting a piece of wood furniture unless it was not salvageable.. I love the blanket ladder it plays an important role in the room. So many beautiful things. You have such great suggestions. Thank you. You incorporate so many great elements in your decorating with which to consider in mine. Thank you. 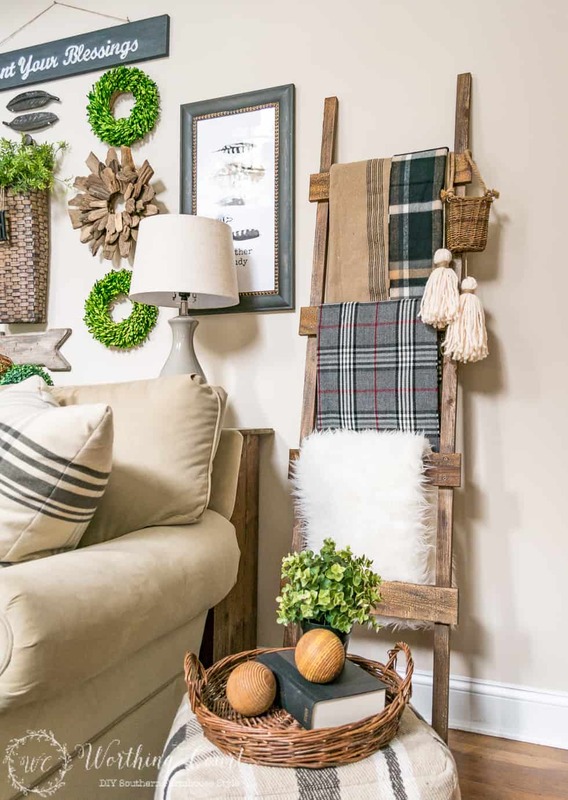 I love how you’ve balanced wood elements with your decor … it really pulls it all together! Great feeling of comfort by adding wood tones. Again, you’re such an inspiration! 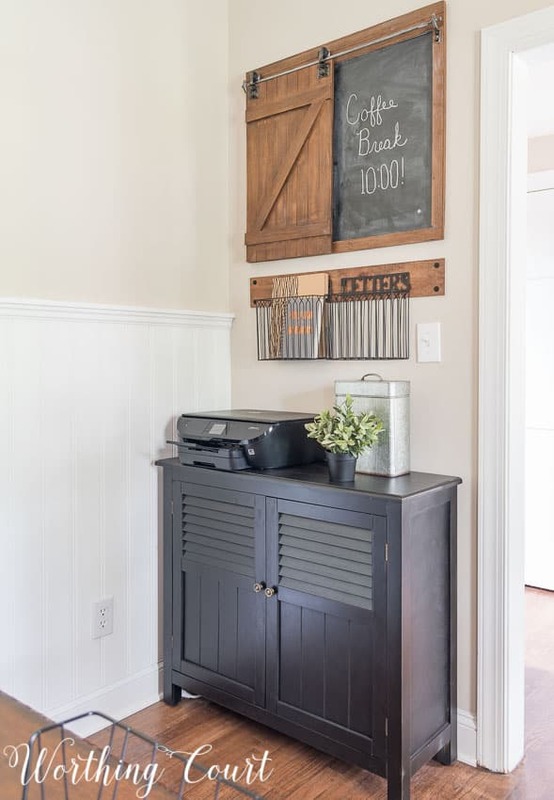 In the farmhouse office makeover, do you have info on the cabinet the printer is on or the barn door blackboard?